MobileVideo4Less.com would like to thank you for making us your first choice as your mobile video entertainment dealer! 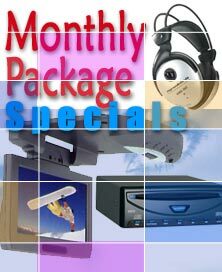 We have a few package systems for those who are looking for quality at a reasonable price. FREE GROUND shipping with the following packages or FREE shipping on any order over $999.00! Awesome Deal! Universal 6inch. Mirror Monitor with Flush Mount Keyhole Color Camera Package! NEW! FORD F-Series All in-one Overhead for Rail System 2004+ Models. 7" Wide with built in DVD player, 2 Wireless Headphones and FM modulator! Myron&Davis 8.0" Widescreen Monitor add-on for 2004 Nissan Armada, Quest & Titan models. Mounts to existing overhead console! 10.4" TFT Flipdown DVD with TV Tuner super package includes 2 wireless headphones, Wireless 4-Channel FM modulator, TV Antenna and installation kit! 15.2" Widescreen DVD with TV Tuner Super Special includes 2 wireless headphones, 4-channel Wireless FM Modulator, TV Antenna and installation kit.